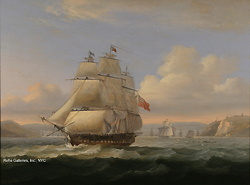 Luny was living on his own by 1780 as his address was given in the Royal Academy exhibition of that year as Anchor and Hope Street, St. George’s, Middlesex; this was also the year he exhibited his first work there. However, the fact that he was still living near Holman leads one to believe that they were still in close contact. In 1780, Holman exhibited his The Engagement between Sir G.B. Rodney and the Spanish Squadron at the Royal Academy – a work that Luny would have been very familiar with. Only 2 years later, 1782, Luny produced his own version of this scene and chose to exhibit it at the Royal Academy.